and convenient to skiing, hiking, antiquing, and many other Vermont attractions. The Karass Inn offers clean, comfortable, simply appointed rooms and a relaxed atmosphere. Guest rooms feature crisp 100% cotton sheets, fluffy duvets, pillow top mattresses, restored antique furniture, and adjoining private bathroom with shower. Guest rooms are individually air conditioned from mid-May through early October. Complimentary high-speed wifi is available in all areas of the building. Please note, there are no televisions at the inn. Guests are invited to enjoy our selection of puzzles and board games, curl up with a book in front of the cozy wood stove in our great room, relax in our spacious yard, or spend time on our patio. Children of all ages are welcome. The inn is completely non-smoking. focuses on fresh, seasonal, local ingredients. Breakfast page for more details. Breakfast at the Karass Inn focuses on simple hearty food prepared with high quality ingredients. * Guests often ask for our breakfast recipes, so now our most popular dishes can be found on our recipes page. If your favorite isn’t available here, drop us an email and we’ll be happy to share! We have the widest breakfast hours in the area- breakfast is served from 7:30 am-10 am (or from 7am-10am during ski season). Winter sports enthusiasts can enjoy a full, hearty breakfast and still make it to Okemo (or other local ski areas) by the time the lifts begin turning, and night owls can have a relaxed morning and a late start. ​We also offer quick to-go breakfasts (please request this option the night before). Breakfast begins with a starter of fresh fruit or home-baked muffins, followed by a hearty home-cooked country style breakfast. 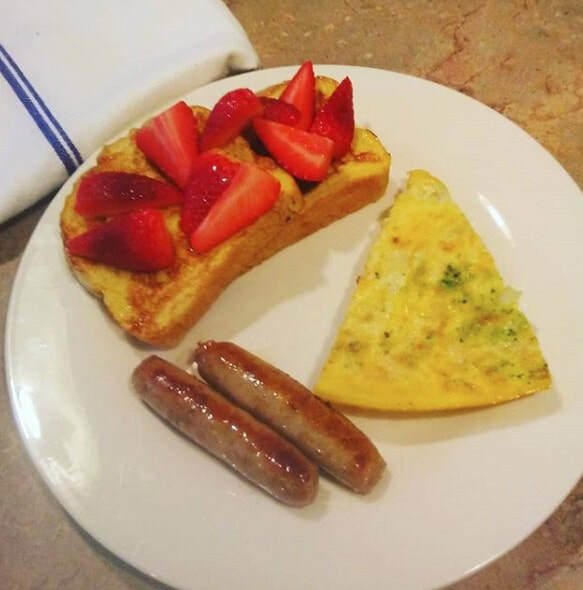 Our menu each day includes an egg-based dish such broccoli cheddar frittata or scrambled eggs, a breakfast meat such as sausage or bacon, and a sweet side such as french toast, waffles, or pancakes. Almost everything we serve is home-made, and our purchased items such as bread and croissants are locally-sourced. hot cocoa and a selection of black and herbal teas. Fruit juice, tea, hot cocoa, and milk are always available, as are fresh fruit, yogurt, cold cereal, granola bars, and oatmeal. Also available for guest use in our dining room is a microwave, an electric hot water kettle, and small refrigerator for storing snacks, leftovers, or the 2 pound block of Vermont cheddar you just couldn’t resist purchasing. 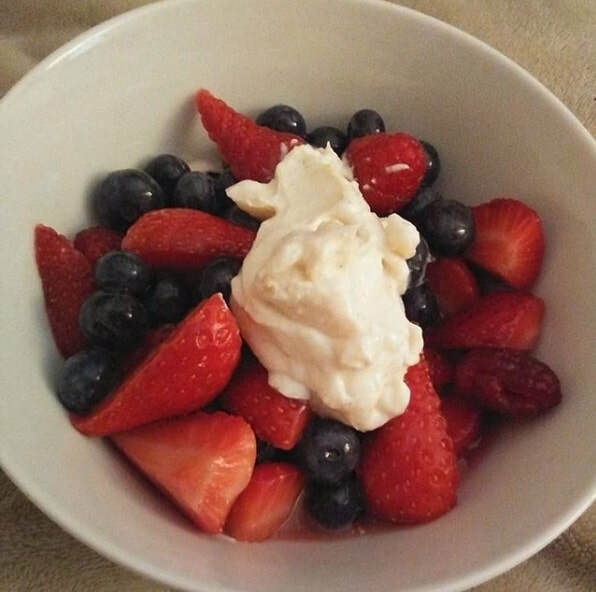 *Our cook is experienced in cooking for a wide range of special diets, including nut-free, peanut-free, vegetarian, vegan, gluten-free, egg-free, pork-free, paleo, Whole30, low fat, low/no added sugar, kid friendly meals, and more. 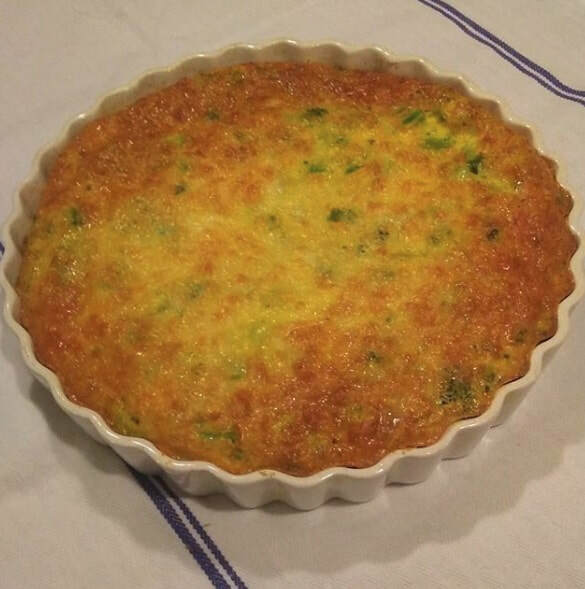 We’re also experienced in cooking for those with severe food allergies who may be cross-contamination sensitive, so please don’t hesitate to let us know about your group’s dietary needs or restrictions. The Blue Spruce room contains one queen bed and is suitable for 1 or 2 guests. All of our guest rooms feature crisp 100% cotton sheets, fluffy duvets, pillow top mattresses, custom upholstered headboards, and restored antique furniture. The Blue Spruce room has an adjoining private bathroom with shower. A hot breakfast is included with your stay. Prices range from $99-$139 plus 9% Vermont Meals & Rooms Tax. Frequent guest, extended stay, and off season discounts are available- please call the inn for details. The Sugar Maple room contains one queen bed and is suitable for 1 or 2 guests. ​All of our guest rooms feature crisp 100% cotton sheets, fluffy duvets, pillow top mattresses, custom upholstered headboards, and restored antique furniture. The Sugar Maple room has an adjoining private bathroom with shower. A hot breakfast is included with your stay. Prices range from $99-$139 plus 9% Vermont Meals & Rooms Tax. Frequent guest, extended stay, and off season discounts are available- please call the inn for details. The White Oak room contains one queen bed and is suitable for 1 or 2 guests. All of our guest rooms feature crisp 100% cotton sheets, fluffy duvets, pillow top mattresses, custom upholstered headboards, and restored antique furniture. The White Oak room has an adjoining private bathroom with shower. A hot breakfast is included with your stay. Prices range from $99-$139 plus 9% Vermont Meals & Rooms Tax. Frequent guest, extended stay, and off season discounts are available- please call the inn for details. The Queens room contains two queen beds and is suitable for up to 4 guests. All of our guest rooms feature crisp 100% cotton sheets, fluffy duvets, pillow top mattresses, custom upholstered headboards, and restored antique furniture. The Queens room has an adjoining private bathroom with shower. A hot breakfast is included with your stay. The Queens room also contains a generously sized mini fridge. The North Suite consists of 2 adjoining bedrooms, each with an ensuite private bathroom with shower, and is suitable for up to 5 guests. This suite is ideal for groups traveling together or families who would like adjoining rooms for convenience but prefer to have the option of a little more privacy at night. All of our guest rooms feature crisp 100% cotton sheets, fluffy duvets, and pillow top mattresses. A hot breakfast is included with your stay. Room A has a queen size bed with plush upholstered headboard and a rollaway bed can be added to this room if needed. Room B features a queen size bed with plush upholstered headboard and a twin sized daybed. Both rooms feature hardwood floors and lovingly restored antique furnishings. The North Suite room also contains a small mini fridge. Prices range from $169-$249 plus 9% Vermont Meals & Rooms Tax. Frequent guest, extended stay, and off season discounts are available- please call the inn for details.